For the first time ever, heavyweights and the women's featherweight division will be on display together when The Ultimate Fighter: Heavy Hitters debuts on FS1 on Wednesday night, Aug. 29. To help this latest cast of fighters get to the next level of their careers, middleweight champion Robert Whittaker and top five-ranked contender Kelvin Gastelum will be coaching the 16 UFC hopefuls during the 28th season of the long running competition series. Both Whittaker and Gastelum will bring plenty of knowledge about this format with them to the show considering they have each won The Ultimate Fighter in the past. Whittaker was part of the international version of the show called The Ultimate Fighter: The Smashes where he represented Australia in a tournament showdown against Great Britain. Over the course of the show, Whittaker proved he was a vicious knockout artist after putting away both of his opponents before winning the show with a unanimous decision victory over Brad Scott. Meanwhile, Gastelum returns to the show that helped launch his career after he was part of the season coached by former light heavyweight champion Jon Jones and Chael Sonnen. While he held a respectable 5-0 record going onto the show, Gastelum somehow slipped under everybody's radar and ended up as the last pick during the team selections. Gastelum quickly changed everybody's mind when he mauled three straight opponents — all by knockout or submission — before then pulling off a win over Uriah Hall to secure his place amongst Ultimate Fighter royalty. Considering the kind of experience they both share from the show, Whittaker and Gastelum are the perfect coaches to get their teams ready for competition this season. The culmination of this season will also see Gastelum finally get his first crack at UFC gold when he takes on Whittaker on a date to be announced. As for the fighters this season, the heavyweights will return to the show for the first time since season 10, when the coaches were former champions Rashad Evans and Quinton "Rampage" Jackson. That season produced a long list of fighters who made waves in the UFC, so this latest cast has their work cut out for them as they look to make a similar impact. It could be argued the heavyweight division has never been as good as it is right now in the UFC, with two-division champion Daniel Cormier sitting on top of the mountain. With fighters like former champion Stipe Miocic and top contenders such as Derrick Lewis, Alexander Volkov and Curtis Blaydes all lurking around, this has been a real renaissance for the heavyweights in recent years. The cast for The Ultimate Fighter: Heavy Hitters features plenty of prospects with the potential to go far in the UFC's heavyweight division. Josh Parisian might be one name that will be familiar to UFC fans after he accepted a short notice fight against Greg Rebello on the most recent season of Dana White's Tuesday Night Contender Series. Parisian made the most of his opportunity with a stunning first-round knockout via spinning backfist. Afterwards, Parisian was offered a slot on the new season of The Ultimate Fighter after he was originally scheduled to be an alternate for the cast. Polish powerhouse Przemyslaw Mysiala will definitely have experience on his side as he steps into the show with more than 30 professional fights on his resume, including five straight wins, all by knockout or submission. Perhaps one of the best prospects to watch this season will be 4-0 fighter Michel Batista, who comes to The Ultimate Fighter after a long career in the sport of wrestling. Batista represented his home country of Cuba in the 2008 Olympics, which was the same year Daniel Cormier was also a member of the American team. He also earned a gold medal in the 2007 Pan Am games in Rio de Janeiro, Brazil. Batista has all the raw physical skills to be a force in the heavyweight division, but he might still be learning on the job when he steps into the toughest tournament in sports. As for the women's featherweight division, the eight fighters represented this season will all look to make an impact in a fledgling weight class where Cris Cyborg rules with an iron fist. Cyborg has looked unstoppable for more than a decade, but the eight fighters joining the show this season will try to eventually find a way to challenge her in the future. Larissa Pacheco will return for The Ultimate Fighter after suffering a couple of tough losses in her previous stint with the UFC while competing at 135 pounds. Now as she competes more naturally as a featherweight, Pacheco will look to build on a submission win in her last fight as she joins the cast this season. 7-1 prospect Katharina Lehner will also join the show this season after making two past appearances in Invicta Fighting Championships. Lehner is looking to bounce back from the first loss of her career when she fell to UFC veteran Sarah Kaufman and she will undoubtedly be motivated to get the job done when the show gets underway. Leah Letson is another name to watch on the show this year as she comes into the house with a 4-1 record, including a thunderous head kick knockout in her last fight against Octagon veteran Elizabeth Phillilps. Letson also amassed a very impressive resume as an amateur, and with knockouts in three of her past four fights, don't blink when she starts throwing leather with her opponents on the show. All told, The Ultimate Fighter: Heavy Hitters will feature 16 athletes representing eight different countries from around the globe. From Australia to Germany to Brazil and everywhere in between, the international talent will be on display as the heavyweights and women's featherweights all look to make a great first impression when the show gets underway on Aug. 29. 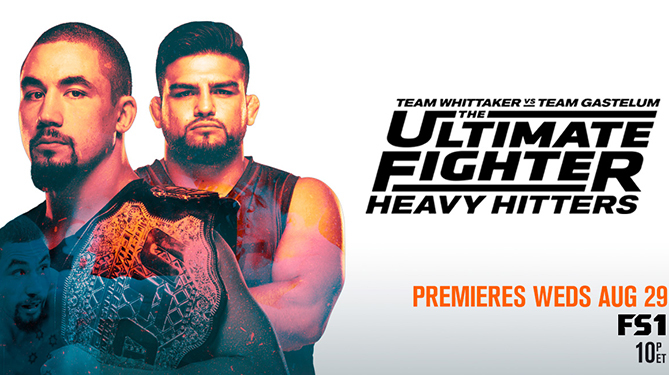 Don't miss a minute of the action from The Ultimate Fighter: Heavy Hitters when the season gets started this Wednesday at 10 pm ET on FS1.